I love shopping. (Insert eye roll and sarcastic comment from husband about me spending his money.) Shopping, especially on the rare occasion that I don’t have my child with me, can be relaxing and therapeutic. I don’t have to necessarily buy anything – although, that’s fun too – its just the browsing and walking and being alone that I enjoy. Last weekend I went shopping with my friend “Roxanne” (this is the name she asked me to use so we can all picture Sting belting out “rooooxxxannne”). It was a last minute “hey I’ve got a coupon to Kohl’s” and then a “oh, yeah, me too” that led to “let’s leave our husbands and children at home and shop for 5 hours”. Or something like that. We shopped for children’s clothing and Roxanne had picked out several things for her kids. I grabbed two shirts and one pair of pants for Mikayla. We moved on to browse other departments. Quite a bit of time went by and the fact that I had two shirts and only one pair of pants was secretly killing me. I didn’t share this with Roxanne because I know it’s irrational – it’s one of my obsessive and perfectionistic tendencies that I attempt to hide because it makes me seem crazy. That second shirt “needed” a pair of pants – even though both shirts perfectly matched the pants I’d already picked up, I needed the same number of each. We meandered back through the children’s department and I grabbed another pair of pants. Then, I let my guard down and said “I feel better now”. Roxanne, being a good listener, caught what I said and proceeded (in love) to laugh and make fun of me. I don’t know why I need to shop like this for Mikayla – I just always have. I blame Carter’s – they make these cute, adorable baby outfits and I got so used to buying her clothes in “outfits” I just never stopped. I don’t shop this way for myself – I shop like a rational human being and purchase a few pants/shorts that match many shirts/tops to create many different “outfits”. But when it comes time to hang clothes in Mikayla’s closet there must be a shirt AND pants on every hanger. This is when organization becomes a problem – when the need to organize becomes a hindrance/obsession rather than a helpful tool. This is why it’s important for those of us with perfectionistic tendencies to be aware of our weaknesses (or have good friends to point them out and laugh with us) so we can be organized without being crazy. I truly think that a little organization can go a long way toward making life easier. But I also think it’s important to have boundaries. If every single inch of your life must be organized to perfection then you aren’t making life easier because your life is consumed with organizing. Organization is a TOOL so that you can get stuff done easier and faster and then spend more time on things that really matter. I don’t fold sheets. Shocking, I know. I have two sets of sheets for each bed and each week I take the old ones off, throw them in the washer and put new ones on (two sets because I don’t always get them dry before bedtime, the extra set gives me more flexibility in my day). When the washer is done, I throw the sheets in the dryer. When the dryer is done I wad the sheets into a ball, shove them in the closet and slam the door before they fall out. I also don’t iron…ever. I never iron. I own an iron, but can’t tell you the last time I used it. It’s been years. These are just two areas where I intentionally neglect doing something in order to make my chore list a bit easier. Wrinkled sheets or a less than spotless floor or crumbs in the car cup holder are far less important than spending time with my family and friends. Taking a few short cuts on household chores gives me time to do things that are more enjoyable – like reading, writing…sleeping. The moral of the story – having an organized home or schedule can be a great tool for making life’s day to day responsibilities less burdensome…so can shoving wrinkled sheets into your closet. Do you battle perfectionism? What boundaries have you established? What’s your “wrinkled sheets”? PS – Only a true friend can help you see your flaws and laugh with you about them. Roxie, I consider myself truly blessed to have you as my friend and am thankful that we can laugh together about our many “issues”. Also, I’m probably going to call you Roxie at least 37% of the time from now on. sometimes “good enough”is exactly perfect! Whatever works best for you is what you should keep doing. 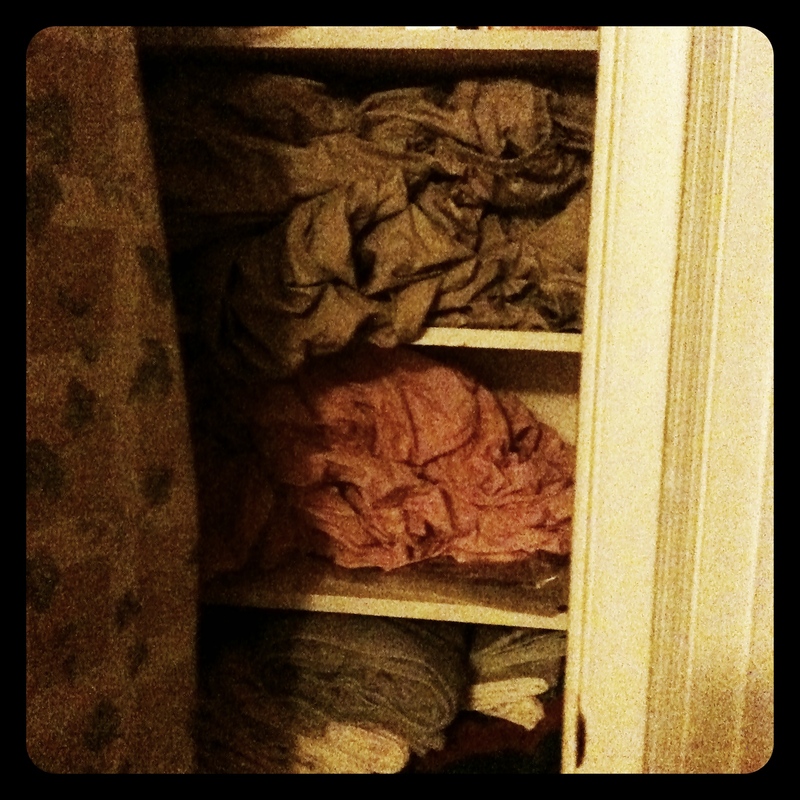 My linen closet looks the same…and I commend you for even washing the sheets weekly….I don’t even do that. Candyce you do have several more beds than I do. It’s not much effort to wash two beds a week – 5 beds would be like a whole day’s work! Found you through your Stuff Christian’s Like link, and am also Team Patrick. The fact that the watch stands out is EXACTLY why I love it. I carry his picture with me and whenever someone brings up how cool my watch is, I proceed to tell them that (besides the fact that you can read it from across the room) it also provided food and education for (ta-da picture comes out) Patrick. I will soon be blogging about it on my blog, as well. Anyway, back to the reason I am commenting here…this is SO my problem. When I was a teenager, I used to try to explain to my mom that the reason I didn’t clean my room was because I was too much of a perfectionist. I couldn’t clean it quickly…if I cleaned, I wanted to be on my knees scrubbing baseboards and such. Therefore, I just didn’t do it, avoiding it altogether. sorry, clicked ok before my blog got entered. I have the condition Niki is talking about. I have heard it called passive perfectionism. It is essential for sanity if you lean toward perfectionism. If I get started toward perfecting something, I can turn into an ugly person. It is best not to feed the perfectionistic beast within too much. Mine will take over if I don’t restrain it. I know how to fold a fitted sheet but I’m with you…not gonna happen.